Washington State Gov. Jay Inslee signed the Solar Incentives Jobs Bill earlier this month, promising support that will help carry the market until the clean energy technology becomes affordable enough to survive without federal tax incentives — due to phase out beginning in 2019. “The bill provides certainty for customers because there was a lot of uncertainty in the market,” said Jaimes Valdez, policy manager for Spark Northwest — a Seattle-based group that works to accelerate the shift to renewable energy sources. That uncertainty was largely due to attacks on the solar industry by utility lobbyists and roll-backs on environmental regulations by the federal government. Solar and renewable energy policies are expected to be among the main issues in legislatures this year — as more moderate Republicans are prioritizing renewable energy over fossil fuels. In fact, hundreds of clean energy bills have been introduced in states across the country this year, according to InsideClimate News. Many did not become law, but some have — including one in Virginia that will set up a pilot community solar program. Washington’s solar incentives bill exemplifies this bipartisan support. The bill was sold as much on it’s jobs and economic development benefits as it was on its climate benefits, Valdez said, adding that there are over 3,000 solar jobs in the state. One of the bill’s sponsors is Republican Senator Doug Ericson — who is from a district with an economy that has heavily relied on oil infrastructure. Further defying the stereotypes, Ericson was also tapped as an advisor to the U.S. Environmental Protection Agency by President Donald Trump’s administration. “There’s a strong awareness that the solar industry is coming into it’s own as a vibrant industry with people and jobs and political support behind it,” Valdez added. Solar employs more than twice as many people as the coal industry in the U.S. — running counter to Trump’s narrative about helping American workers by trying to prop up the dying coal industry. The cost to install solar has dropped by over 70 percent since 2010, according to the Solar Energy Industries Association. And last year, solar installed 39 percent of all new electric generating capacity, outdoing all other technologies for the first time. Almost nine out of 10 Americans favor expanding solar power to address energy and environmental costs, a Pew Research Center poll found in 2016. The biggest battle in the solar industry currently is about the practice of net-metering — which allows solar customers to sell back extra energy to their utility’s grid. Utilities have been fighting in a growing number of states to roll back net-metering policies. Net-metering drives down costs for residents who want to install solar panels and was seen by many in the industry as one way to make sure the market continued to grow as federal tax breaks for solar phase out. But utility lobbyists argued it unfairly shifts the costs to grid users who don’t want to or cannot install solar themselves. That opinion hasn’t been supported by the research. A review of studies by the Brookings Institute found that net-metering is almost always a net benefit to all ratepayers and even the utilities themselves. The effort to roll back net-metering policies is more likely an attempt to “stall out” the solar industry, one expert said. “The fights at the state level are about imminent decisions where you have the utility industry trying to stall out the solar industry — especially rooftop solar — as quickly as possible and making really overblown arguments about cost-shifting,” said John Coequyt, director of federal and international climate campaigns for the Sierra Club. “The consensus view right now is that by the time (the federal incentives) phase out in 2022, solar will be cost effective in so many parts of the country that it will continue to dominate the energy market,” said Coequyt. Utility interests have been trying to persuade regulators to get rid of net-metering policies in recent years in states including Indiana, Missouri, Nevada, Arizona and California. “In some states they’re going through an honest analysis process to get fair rates, and they’ve found that often, those look a lot like net-metering,” Coequyt said. “But sometimes, utilities engage in processes that aren’t an honest push for fair rates but are clearly designed to kill the solar markets in those states,” Coequyt said. Nevada, for example, decided to phase out its net-metering policies even after a study by its Public Utility Commission found that net-metering yielded $36 million in net benefits overall. The state later reversed that decision, restoring net-metering. Utility companies are able to influence state policies because they are “big campaign donors with deep political influence,” according to Bloomberg. The attacks by utility interests on solar were seen as one of the reasons why solar industry growth has slowed in 2017. On the federal level, President Donald Trump has proposed a solar tariff on imported solar cells — a moved he said would support U.S. companies that make solar cells; but estimates show it could put one third of the solar workforce out of work. Another decision Trump made that has cast uncertainty on the renewable energy industry withdrawing from the Paris climate deal and rolling back environmental regulations in favor of the fossil fuel industry, especially coal. Again, Washington state became a leader in environmental progress as Gov. Inslee helped to establish the U.S. Climate Alliance — a group of 13 states and Puerto Rico who have committed to meeting or exceeding the U.S.’s Paris pledges despite Trump’s decision. The move to form the Alliance and the signing of the Solar Jobs Incentives Bill will give the industry the support it needs to become sustainable after the federal tax credit for installing solar ends, experts said. With the passing of the solar incentives bill, the state fund will now pay any Washington homeowner who installs solar based on the amount of energy they produce. The bill was an extension of previous incentives, which were due to run out in 2020, and will last until 2030. The new law also sets up a program called shared commercial solar — a policy under the larger umbrella of community solar that allows customers who can’t install solar panels on their own homes to participate in an off-site solar array and receive energy cost savings. This is a program that could potentially bridge the gap between utility interests and the clean energy movement. That’s because shared commercial solar allows utilities to develop large solar projects that corporations and industry customers can buy into and receive savings on their energy costs. These types of programs are one reason some utilities are now seeing solar as an investment opportunity, instead of a threat. 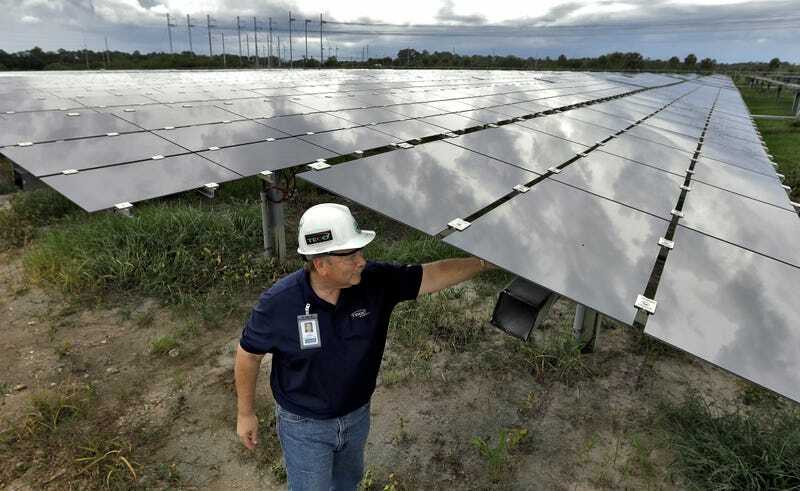 Seventeen states have already taken steps to enable community solar, including Virginia, Illinois, and Rhode Island, according to a report by the NC Clean Energy Technology Center. At least five other states that didn’t have community solar policies had legislation introduced in 2017 to enable those programs. By supporting community solar and shared commercial solar, Washington and other states are steadily making progress to support solar and reduce costs — even as net-metering is phased out in other states. “Legislators see that solar is popular; they see that people want more choices and are giving customers tools to do that — despite what’s happening at the national level in terms of pulling back on climate change,” said Valdez.